Ceva Logistics has recently put 85 new Volvo FM11.450 Globetrotter tractor units into service. The specification includes a comprehensive focus on safety and security features including an electronic braking system with stability control and an electronic parking brake with audible and visible warning devices. The new FMs all have the 3,800mm wheelbase, and are 6×2 fixed pusher axle tractor units with full air suspension, Extra Low chassis heights and low profile tyres. Powered by Volvo’s D11K Euro-6 engine rated at 450hp, the vehicles also come equipped with Volvo Engine Brakes. Coupled to these power plants are Volvo’s I-Shift automated transmission systems with 12 forward gears and RSS1356 single reduction axles with a ratio of 2.50:1, round off the drive train. The Extra Low chassis height improves both driver cab access and visibility levels. The latter enhanced views are further complemented by additional; factory-fitted lower glazing panels in the passenger doors. On the road, Ceva drivers will benefit from Adaptive Cruise Control with a heads up warning, besides Advanced Emergency Braking Systems, Lane Keeping Warning and Lane Changing Radar systems with in-cab warning devices. To promote safer trailer changing, Ceva Logistics has specified full width chassis catwalks and nearside Susie ground coupling equipment. The trailer connection indication system includes sensors for height, kingpin and coupling locks. Vulnerable road users have also been taken into considerable with audible left turn alarms, mobile CCTV camera systems and anti-spill fuel tanks. 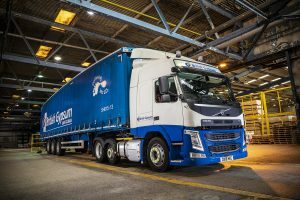 The new FM fleet will transport British Gypsum’s interior lining systems from five specialist-manufacturing sites to more than 3,500 stockists throughout the UK.